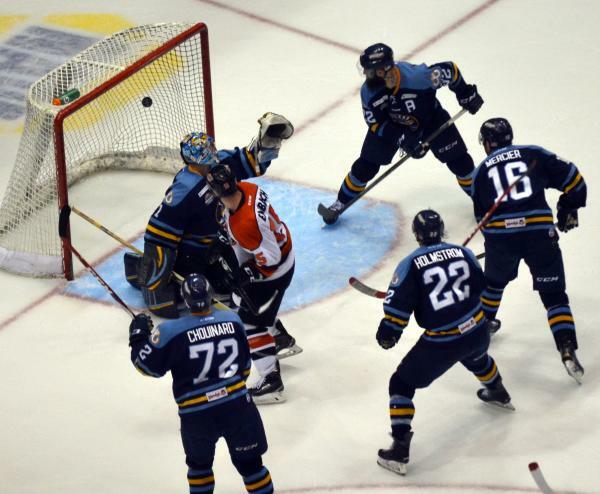 If you are reading this and are not going to the games, your missing classic Komets Hockey. It really does not get any better. Again, just like Tuesday, after about the 11 minute mark in the first period, the komets looked stronger for the rest of the game. Actually seemed to get stronger as the game went on. I liked the hustle of Severyn, Meurs and Pistilli last night. Love the way most of our guys are playing. lot of HEART!!!!!! Beside the fact that they won the game, the best part and maybe my best memory of the game was watching the team celebrate the winning goal. Their happiness, just overflowing and totally honest, was a testament to the "togetherness" this team feels for one another. You can tell they like each other and care for each other, too. While the goal didn't come from the most likely source, it didn't matter. If any egos exist, you couldn't tell it. Everybody seemed thrilled and overjoyed with outcome. That's the memory that will stay with me. The rest of the series? Well I'm hoping for more games with similar memories. Alan, you said more in the shortest post you have ever posted. The mark of a great writer is saying as much as possible with the fewest words. You are getting better! I agree with 100% of what you said. I like your new style. Gee, RG2, thanks! But I'm not sure I've changed my style. Just wanted to portray to everyone how "genuine" that celebration felt. By the way, tomorrow is Mother's Day. To everyone lucky enough to have their Mom, spend some meaningful time with her. Maybe you could even bring her to the hockey game! Faceoff is at 6pm (not 5pm as normal).